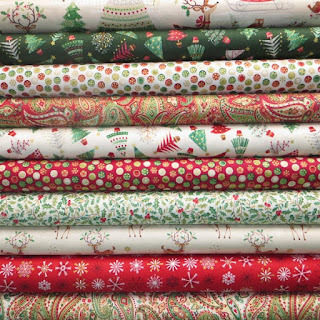 Pelenna Patchworks: Christmas fabric selection available, plus bargain fabric category just added! Christmas fabric selection available, plus bargain fabric category just added! 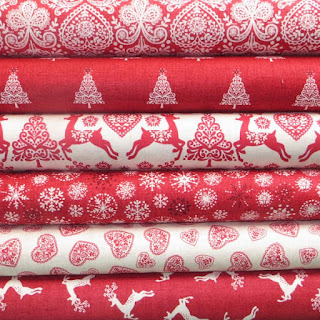 Our Christmas fabrics have started to arrive for this year (never too early! ), with Makower's Traditional Metallic and Scandi ranges - perfect for projects such as tree skirts, table decorations and wallhangings, and coordinating well with the Makower Christmas panels! The other new category - bargain fabrics - on the website gives you a chance to bag a really good deal, with all fabrics at £7 per metre or less - the same great quality fabrics from top manufacturers, but end of line and discontinued prints meaning we can offer them to you at this great low price! Moda Cake Mix Recipes 5 - 8 now available!